I’m a new pilot with 100 hours of flying time in a Cessna 172, a Cessna 162 LSA, and Tecnam Sierra LSA. 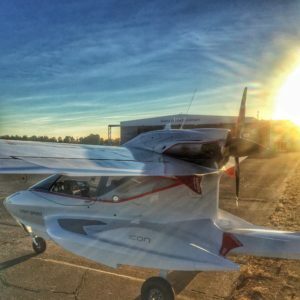 Last week I had the opportunity to get my seaplane rating in the new ICON A5, the light sport airplane designed from the ground up to reignite public interest in flying. The process I went through, called “transition land” training by ICON, qualifies the pilot for a seaplane rating on successful completion. I am not paid by ICON and received no special treatment as a student pilot in exchange for this blog post. I flew the A5 for eleven hours over seven flights on three days with two separate instructors, both former fighter pilots. It is by far the most fun and engaging flying experience I’ve had or can imagine having as a private pilot without aerobatic aspirations, especially when operated on or over water. Let’s start over water because that’s where the ICON really stands out. 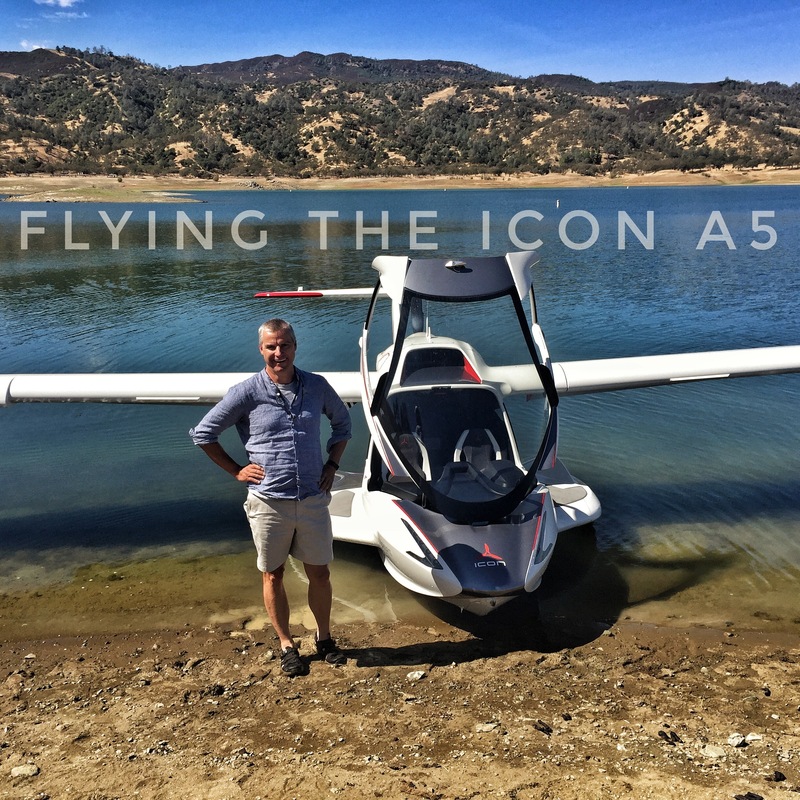 It was a gamble for ICON to design the A5 for water and it causes several complications (like retractable landing gear) but it pays off. On our test flights we headed west from Yolo County Airport (KDWA) for about ten minutes until we reached a narrow canyon 2000 feet high that leads to Lake Berryessa. Once we reached that canyon, we started to fly the ICON much closer to terrain than I had ever experienced – two orders of magnitude closer. Here’s the deal – FAA regulations require pilots to fly at a minimum safe altitude that allows for an emergency landing at all times, and to avoid any people or structures by 500 feet (There’s a lot more to it, but let’s start there). Over land, pilots usually operate at least 2000 feet above ground, and even during emergency practice we rarely go below 500 feet. Over water, there’s an emergency landing spot beneath you at all times and there are few people or structures so you can fly much lower without violating FAA rules or putting yourself in undue danger. Once we reached the lake my instructor and I started flying about 50 feet above the water and a few hundred feet from the land, the hills and the trees. I got used to maneuvering 300 feet or so above the lake to survey wind, landing sites, beaches, etc. On subsequent exercises we practiced flying five feet above the water and even dipping the tail in the water. Needless to say, this was tremendous fun. A fair bit of instruction was devoted to handling the boat on the water. The plane takes some thought to handle well – it tends to turn into the wind, which has surprising consequences. There’s a retractible water rudder to help with difficult maneuvers at low speeds. The plane can be taxied “on the step” at higher speeds (about 30 knots) which is a blast but I admit I didn’t master this high speed taxi and sometimes found myself inadvertently airborne. The A5 handled reasonably rough water without too much trouble – rough meaning occasional whitecaps but not constant whitecapped waves. After one rough water takeoff and landing with the windows removed I had a half inch of water in the cupholder by my left elbow! I was surprised by how much water and wind conditions varied over the surface of a medium sized lake; I think in most cases one could find a suitable landing site. One surprise from training is that glassy water, which looks so beguiling, is actually a dangerous landing surface because of lack of visual altitude reference. We practiced simulated landings on glassy water, which is treated as an emergency situation to be avoided. Some of the A5’s handling and safety advantages are evident when flying over land, and it’s fun to fly with the large side windows removed, but over land it’s not quite as revolutionary compared to other LSAs I’ve flown (Cessna 162 and Tecnam Sierra). Everything in the ICON is nicer, safer, well thought out, but it’s not vastly different. It takes off and lands just fine. It’s slow in cruise and when fully loaded on a hot day it didn’t climb all that fast – When doing pattern work fully loaded on a hot day I wasn’t reaching 1000 feet above the field by the midpoint of the downwind leg. Even as a low time pilot I had no trouble (and quite a bit of fun) landing the ICON in a 10 knot crosswind, just 2 knots shy of the 12 knot crosswind limit. Thanks to my stone-cold nerves of steel instructor Spike for giving me the opportunity to try this. Power-off landings are especially easy in the A5 because the Angle of Attack Gauge (see below) makes it easy to maintain the best rate of glide. Taxiing the A5 on land requires some finesse because of the free-castering nosewheel, which allows for tight turns but means that steering is accomplished only by wind over the rudder or differential left-right braking when necessary. It’s not difficult by any means, it’s just difficult to do smoothly. Unlike most small planes, the A5 comes with an Angle of Attack (“AoA”) gauge, which provides a direct measure of the air moving over the wing. Training in the A5, particularly for existing pilots, focuses on the use of the AoA gauge in cases where pilots previously had been trained to using airspeed and other indirect indicators of the wing’s flight. I really enjoyed flying with the AoA gauge and found it intuitive and useful. I’ll miss it on every other plane that I fly for the rest of my life. It was especially great for setting up simulated emergency water landings – just set the Angle of Attack at the dotted white line until 15 feet above the water then roll out of the descent. Even this rookie found that hard to screw up. Everyone’s been talking about this but it’s true – the A5 stalls very predictibly and comfortably and remains very controllable in a stall. In stalls with the power on the plane just sort of sat in the air, stalled but controllable. My instructor showed me that you can even point the nose left or right in a power-on stall – in most planes that’s a recipe for a nasty spin. Stall recovery was simple and fast. I’m no expert, having never spun a plane, but I can confirm that the A5 has very docile and benign stalling characteristics and seems highly spin resistant. One of my favorite safety features of the A5 is that it’s got the fastest and most intuitive go-around procedure I’ve encountered – just give it full throttle and climb (yellow line on the angle of attack gauge). There’s no need to mess around with carburetor heat or flaps, the throttle is huge, and one practices tons of go-arounds over water anyway, so if things don’t seem quite right on a landing the pilot can simply choose to take his or her time and go around for another try. This gave me the confidence to try for landings that I might have otherwise aborted sooner, because I knew that I could go around if things got scary. It felt calm, I loved it. ICON has given a lot of thought into making the A5 as safe as possible and they’ve made some really impressive safety gains. I haven’t even mentioned the parachute yet. So how are pilots going to mess this up? My guess is by flying it into stuff. The ICON is designed to be flown more aggressively and closer to terrain than most other planes, and to be accessible to relatively inexperienced pilots. It can turn on a dime and visibility is amazing in virtually every direction, but I suspect that when mishaps occur they may often be due to pilots flying into terrain, trees, power lines, etc. The other big challenge, which ICON recognizes, is the retractable gear. A pilot who attempted a landing on land with the gear in the “up for water” position would damage the plane but is probably not in danger. Nobody knows for sure what would happen to a pilot who attempted to land in water with the gear down, but one harrowing possibility is that the plane would flip over. Training in the A5 understandably emphasizes checking the gear before landing. I had two separate mechanical problems related to the rudder. During water taxi operations on one flight, which require a lot of rudder input, the rudder pedal assembly came loose and began to wiggle around in the plane. We flew back to base and switched into a different plane. On my final landing the water rudder popped out of its hinge and began scraping against the hull of the plane, impeding free movement of the linked flying rudder. This could have been a problem if I had been doing touch-and-go landings since I’d have had limited flight rudder control. The A5 is a great plane and it is incredibly well designed within the constraints imposed on it. In this section I’ll mention a few things that I’d change if I could, limiting myself to actual changes not hypothetical but impossible wish lists like “I wish it went faster”. Elevator Trim The A5 requires very little trim adjustment to fly but using a bit of elevator trim is a good idea for safe flight. The trim adjustment on the A5 is a switch on the stick that provides very little feedback – I couldn’t always tell whether each nudge on the switch was changing the trim or not. The indicator lights on the center panel move in a direction opposite my intuition and don’t correspond one-to-one with adjustments made on the switch. The main analog altimeter is a big gauge with only one hand. Visually it’s difficult to discern altitude increments smaller than 200 or 300 feet. A standard two-handed altimeter is easy to read to within about 10 feet. The barometric pressure gauge used to set the altimeter is tiny and very hard to read. Luckily there’s a digital altimeter on the detachable Garmin avionics module that replicates a standard gauge and I used that one more frequently, but it’s sometimes fiddly to get the right screen showing on the avionics. The AoA gauge has two key indicator lines – a dotted white line set horizontally and a yellow line somewhat above that one. Those lines are faint and hard to see, it would be easy to make them more prominent. ICON has obviously put a lot of thought into its training program. For the company to be successful it’ll have to train a lot of pilots, many from scratch. I could do a whole post on the training process that I saw. In summary I thought it was excellent and well thought out, both of my instructors were really great. 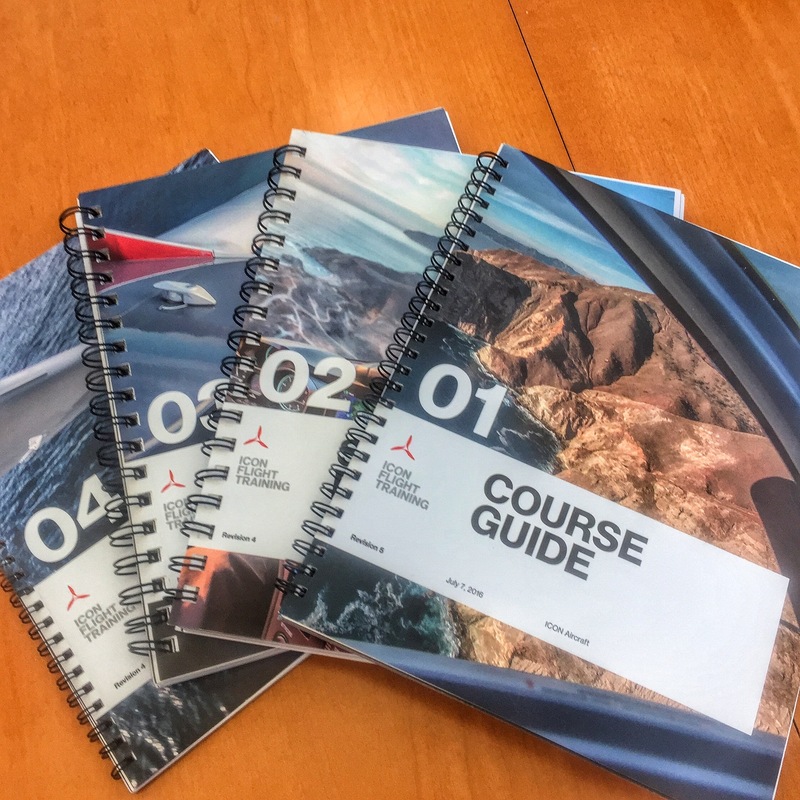 Prior to arrival I was sent four well-produced training manuals for the A5 and was asked to study certain sections of them carefully, pertaining to the specific training that I was taking as a land pilot. An online version of the training materials is coming shortly. The preparation materials also contained a syllabus explaining each of the training flights we’d do that week and the skills and exercises we’d practice on each flight. I was surprised that the Pilot’s Operating Handbook, the essential bible of any airplane, wasn’t part of the pre-instruction syllabus. I had to write and call ICON specifically to request it before training. I suspect it’ll be incorporated into the preparation materials in the future. Private flying is in decline. The number of private pilots has fallen roughly in half in my lifetime. In response, in 2005 the FAA created a simplified license category called Sport Pilot with a streamlined training process and strict limitations on the size and power of airplanes that could be flown. Qualifying planes are called Light Sport Aircraft (“LSA”). Unfortunately the sport flying regulations didn’t arrest the decline. 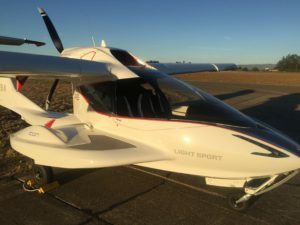 Getting a sport flying license is still time consuming and expensive and the planes available in the Light Sport category can be uninspiring yet expensive. The ICON A5 was designed to make flying more accessible and more fun. As a light sport airplane it can be flown by pilots with somewhat less training. It can be flown from water and from small airports without intimidating air traffic and control towers. It can be towed on a trailer, it sets up quickly and it is designed to be as safe as possible. 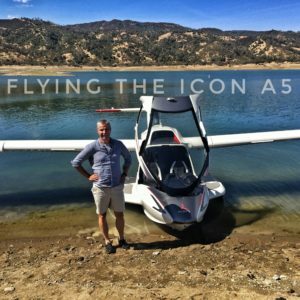 ICON is doing a great job promoting the plane through non-flying media like Outside Magazine and Men’s Journal as well as through social media. Still, flying the ICON is not as accessible as you want it to be. For starters, the plane costs basically a quarter of a million dollars. Veteran pilots, insert your favorite comparison here: “For a fraction of the money you could by a good used ___, which is faster, carries more people, is safer, etc.” The only comparison on which the ICON wins out is fun. The training barrier, which ICON has worked hard to manage, is still large. 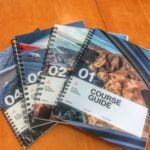 ICON offers a two week program that can get a complete novice to a sport pilot license, if a student comes well prepared and is blessed with good weather. They’ll have to move a lot of new pilots through that program to be successful. Even for existing pilots like me the ICON requires more training than usual due to the water operations. 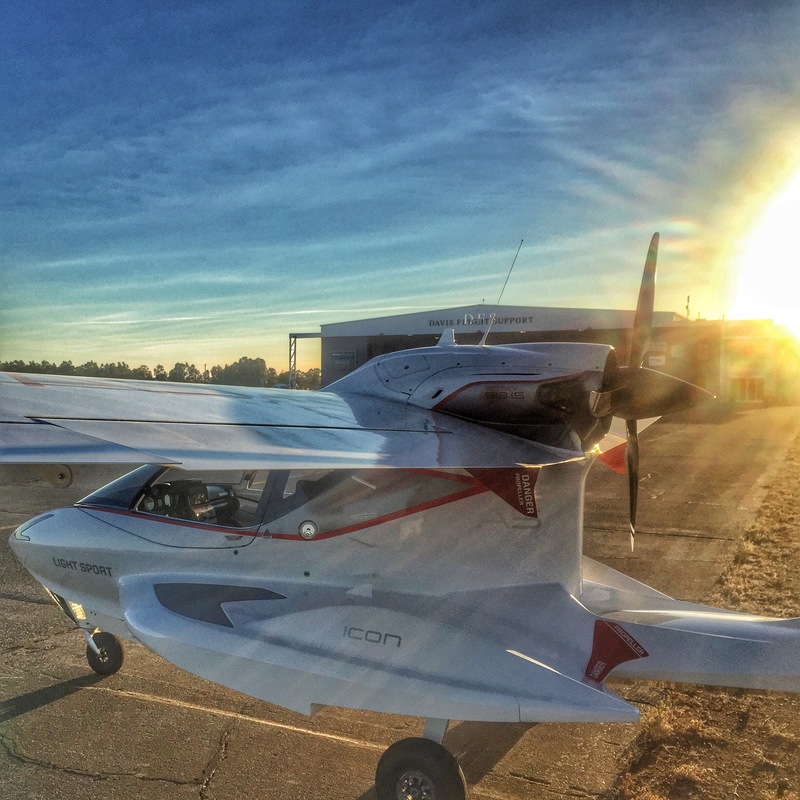 ICON is ramping up production and large numbers of the plane might start being delivered in 2017. The company has a backlog of preorder customers who have paid between $2,000 and $5,000 for a place on the preorder list. Some have been waiting for almost a decade and placed their orders when the estimated cost of the plane was $100,o00 lower. How many of these preorders will actually buy a plane when their turn comes? It would be a lot easier to imagine splitting the cost among a group of friends or adding an A5 to a flying club’s stable, but that would require even more pilots to get trained. I don’t know if ICON will succeed in their mission to revolutionize flying but I wish them well and I’m inspired by what they’ve achieved. Kirk Hawkins and his team at ICON have created a beautiful, joyous thing.